The Canadian Alliance of Medical Laboratory Professionals Regulators (CAMLPR) is pleased to announce that Corporations Canada has granted CAMLPR’s Certificate of Incorporation under the Canada Not-for-profit Corporations Act. 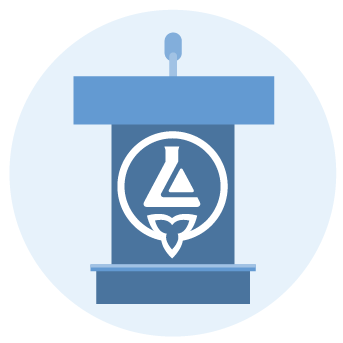 The CMLTO Consolidated Bylaws require all Practising members to carry professional liability insurance (PLI) in all medical laboratory practice employment settings. The College randomly selects members who are required to provide proof of PLI through an online annual audit. Those selected have been notified and are required to complete the PLI audit by Friday, July 6, 2018, 11:59 pm EST. Please email the Registration department at registration@cmlto.com with questions. Friday, May 25, 2018, 4:30 pm, is the deadline to submit your application. The Council establishes the CMLTO's strategic direction and the outcomes that will lead self-regulation forward in the interest of public safety. It invites engaged, motivated MLTs to run for Council election in 6 districts of the province. 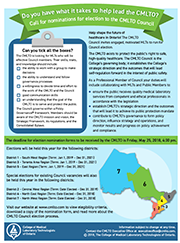 Answer the Call for Nominations and help shape the future of healthcare in Ontario! An FAQ (PDF) was created as an outcome of the webinar, read it by clicking here. CMLTO is pleased to announce the release of its ninth annual Medical Laboratory Technologist Health Human Resource Exploration report. This analysis of the 2017 CMLTO membership data examines MLT practice, employment facility and status, and the provision of MLT education. 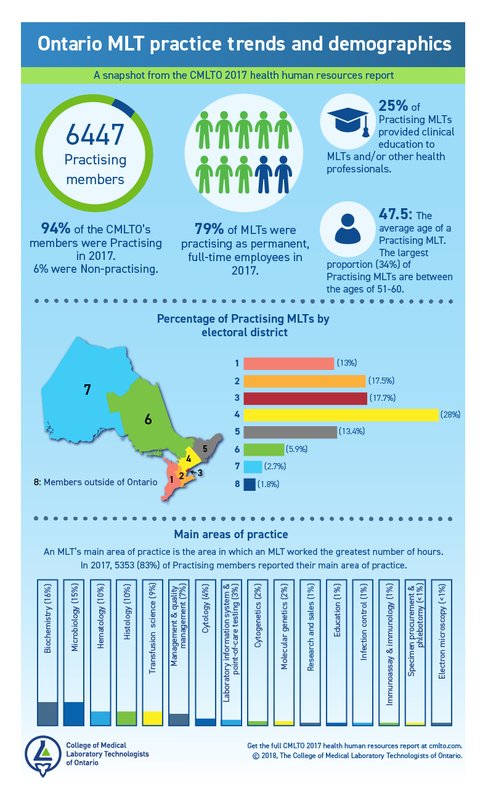 New for 2017, CMLTO is releasing an Ontario MLT practice trends and demographics snapshot. Health human resource planning is informed and supported by health professional demographic and practice-specific data. Read or download the report (PDF) by clicking here and read or download the snapshot (PDF) by clicking here. Please note that the CMLTO office will be closed on March 30, 2018, for the Good Friday statutory holiday. Regular office hours resume on April 2, 2018, at 8:30 am.